The wish will stay with your home and last forever. Japanese roof tiles, or kawara, have been an important element of Japanese architecture since ancient times. Not only as a tool to protect the roof from damage, people make a special wish on roof tiles and attach them on the roof. Many of them represent people’s wishes for warding off misfortunes and welcoming good luck. There are a wide range of kawara designs, each with their respective meaning. Typical examples of kawara, being a symbol of people’s wish, is the oni-gawara. Oni-gawara are roof tiles or statues depicting a Japanese demon (oni) or a fearsome beast. It is said that moon light has the power of purification. As there are many legends and fairy tales about the moon, all around the world, the gentle and beautiful moon always stays with people during their lives. The burning sun is a symbol of the blessing of light and energy. People see eternal prosperity from abundant energy and brightness of the sun. Human beings have always wished upon stars since ancient times. Looking at the wonderful starry sky, what kind of wish would you make? A sword symbolizes the throne of a king. It was regarded as an essential weapon for a king that possesses magical powers and encourages firm self-determination. This symbol represents the people’s wish to become pure, strong individuals. The Chinese character on this oni-gawara means “King,” which is the highest form of authority of a country. This symbol shows the wish to achieve to be the top in any chosen field and to make great success and fortune. Kings and rulers must always remind themselves to be honorable and to do good. They must have wished upon the “Eternal Great Peace (taihei)”as their most important priority and have had such characters on the kawara. The magic mallet often appears in Japanese old folk tales and legends. Being shaken, the mallet gives anything that the holder wishes. This roof tile design often appears on the roof of storage spaces with the roof tile of a Drawstring Purse as both of them are the symbol of wealth. Shoki is the ancient Chinese guardian who is believed to have saved the life of the emperor. Shoki is one of the most popular roof tiles for its protective power. Many machiya townhouses in Kyoto have different types of Shoki. The treasury gem is believed to have the mystic power which can make any wish come true. This design often appears on the roof of storage spaces with the roof tiles of the Magic Mallet as both of them are the symbol of wealth and luck. The Buddhist sutra was regarded highly important as it contains all of Buddha’s important teachings. This particular sutra belongs to the deity of intelligence, which bestows intelligence on people and leads them to peace. Rinpo is an ancient Buddhist arm which has been transformed into a sacred pattern to be the protective avatar of Buddha. A roof tile with this design employs the power of Rinpo to get rid of anxiety and the worries of people. Although they grow in the mud, the beauty of lotus flowers has a mystic power. Lotus flowers have been respected as a symbol of purity since ancient times and are incorporated in the designs of the pedestal of the Nyorai Buddha. The very early roof tiles made in the Asuka period (6th century) had this design. People used drawstring purses to keep money, thus, they have been the symbol of saving money. This roof tile design often appears on the roof of machiya townhouses with the roof tile of the Magic Mallet as both of them are the symbol of wealth. The swirling water on the top represents protection from fire. This design, which is most popular with machiya townhouses in Kyoto, has been popular since old times in order to show people’s wishes to protect their properties from fire. March 3rd is the day of the Hina Matsuri Festival in Japan, a traditional celebration for girls’ healthy growth. 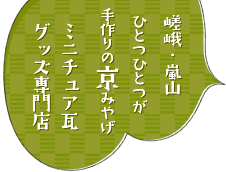 The peach flower is regarded as a guardian symbol of girls. Families in Kyoto display a gorgeous display of dolls and hold traditional Hina Matsuri ceremonies. The powerful dragon rising to the sky has been respected as a symbol of business success and prosperity for a long time. Traditionally, dragons protect the southeast direction, thus, temples in Kyoto often have a roof tile of a dragon facing this direction. The five-color clouds represent the five joys of life: to learn virtues, to live long, to acquire wealth, to live healthy and to live a full and natural life. The clouds were painted by angelic colors in ancient times. Traditionally a cowl has played an important role for a Yamabushi monk who trains himself severely in the mountains. As the cowl protects them from illness and damage, the roof tile of this design has the wish of people who want to protect their precious houses from damage and illness. 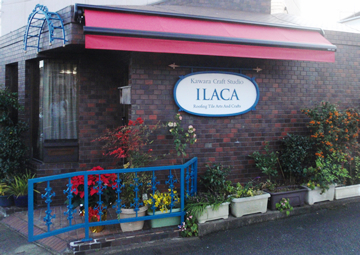 All of ILACA’s kawara items are produced with the same materials and traditional techniques (ibushi kawara) as that of temples and machiya townhouses. ILACA offers a variety of miniature kawara goods, from small oni-gawara objects, photo stands, incense holders and straps to, of course, real kawara for use as roof tiles.